UPDATE: 606 Congress has closed. I was sad to hear the news. A new restaurant, M.C. Spiedo, will be opening in its place. Saturday, September 22, 2012. It was three weeks into my first semester at college. I had lost my voice, the construction outside my dorm had become a 6:30am alarm clock I couldn’t turn off, and my boyfriend was force-feeding me Robutussin, one of the more vile substances ever approved for human consumption, so I could attend a friend’s birthday party at Max Brenner. Clearly, I was in need of a good meal. 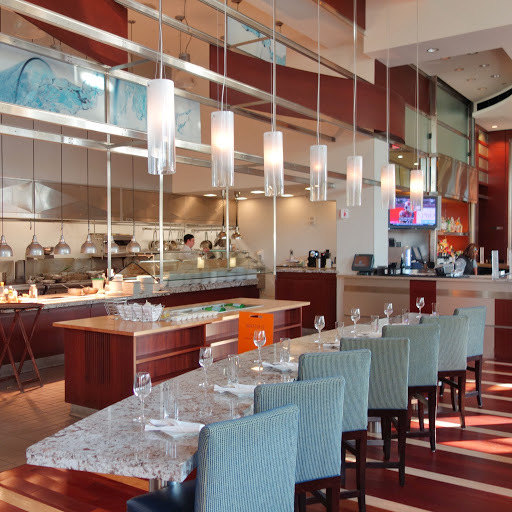 And so for our Saturday dinner, my boyfriend suggested 606 Congress, located in the Renaissance Boston Waterfront Hotel. I recognized the name of the chef, Richard Garcia, because I follow him on Twitter. Earlier this year my boyfriend read a blog post on Tiny Urban Kitchen about a cooking lesson the blog’s author won with Richard Garcia back when he worked at Tastings Bar in Foxboro, MA. The author had asked Garcia to show her one of his most famous dishes, and he chose roasted chicken. Roasted chicken is something of a Holy Grail for my boyfriend, so obviously upon reading that it was only a matter of time until he tried Garcia’s. My friend’s party was at 9pm, so I scheduled dinner for 5:30pm. The restaurant was empty when we arrived. This seems more typical of restaurants situated in hotels, that they are emptier earlier in the evening, and I like this. Crowds aren’t my thing. The dining room was large, open and well-lit, with high ceilings. There was also a seven-seat bar-style table that faced the portion of open kitchen, affording seven lucky diners a great view. We sat down in one of the larger booths and ordered quickly. 606 Congress’s seven-seat bar-style table with a view of the kitchen. When our appetizers arrived, the first thing I noticed was the composition of the dishes. It was beautiful. My food photography really doesn’t do it justice. Someone in the kitchen apparently likes to draw food as much as he likes to eat it. I ordered the spring pea soup ($8), which was like spring in a bowl. It came with lemongrass cream, spring garlic, and just enough croutons that I had one for each bite. The texture was very light, borderline foamy — a perfect appetizer soup so that I’d still be hungry for my entree. I ordered it hoping that if I ate healthy then I’d feel better sooner, but it also ended up being delicious. 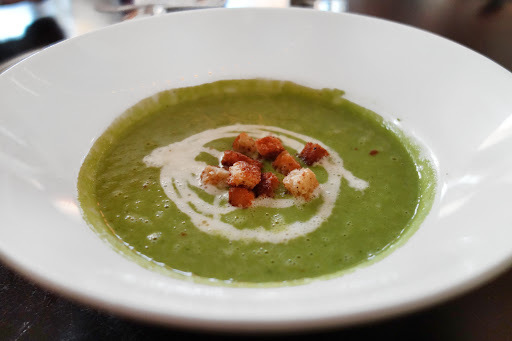 Spring pea soup with lemongrass cream, spring garlic, and croutons. My boyfriend ordered the smoked haddock chowder ($8). Fish chowder is a quintessential New England dish with lots of variations, but “smoked” was a twist we hadn’t tried before. It arrived hot, salty, creamy, carefully spiced so as not to be overpowering, and had a definite smoky flavor to it. 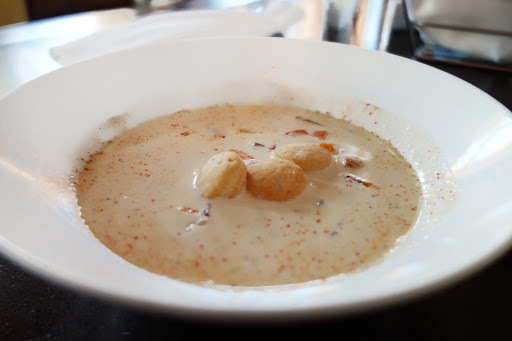 I have pretty high standards for chowder — the fish chowder made by my boyfriend’s mother is one of my all-time favorite dishes — but 606 Congress’s held its own. Smoked haddock chowder with house baked oyster crackers and paprika. 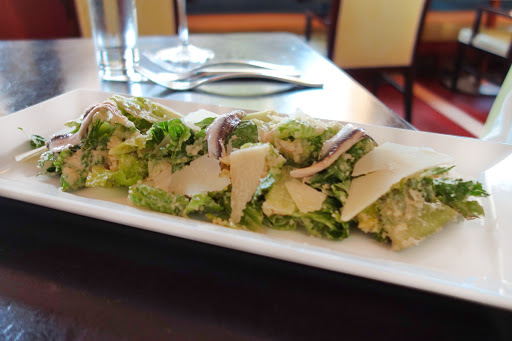 Speaking of which, my boyfriend’s mother began with the romaine heart salad ($8) with parmesan, Caesar salad dressing, and most importantly, white anchovies. There aren’t many foods she speaks as fondly of as white anchovies. I’m pretty sure that’s why she ordered the salad to begin with. It lived up. Romaine heart salad with white anchovies and parmesan. For entrees? Obviously, Boyfriend ordered the aforementioned roasted chicken ($28), served with local potato puree and a small portion of vegetables in a shallow pool of delicious natural chicken jus. It was juicy, tender, and flavorful. 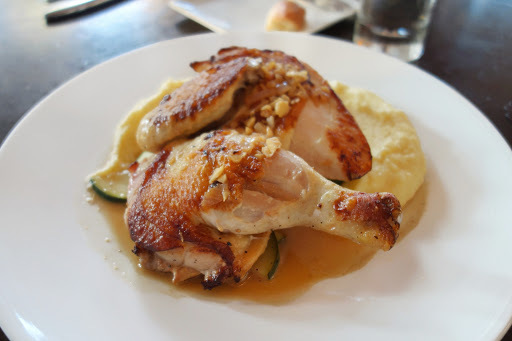 My boyfriend still has another favorite roast chicken — unsurprising, if you’ve read my post on Hamersley’s Bistro — but he absolutely enjoyed, respected, and finished Chef Garcia’s version. Roasted all-natural half chicken with a local potato puree, small portion of vegetables, and natural chicken jus. His mother chose the Archer Angus Farms grass-fed beef filet ($36), served with a carrot puree, turnips, and bordelaise sauce. She quite liked it, describing a “maple syrup-y” flavor to the dish. 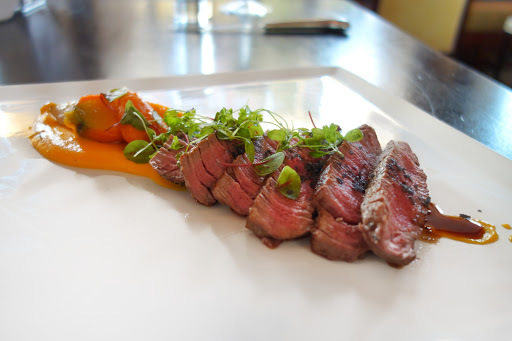 Archer Angus Farms grass-fed beef with a carrot puree, turnips, and bordelaise sauce. And me? 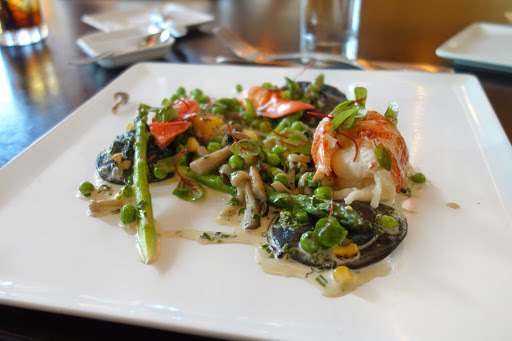 I had the butter poached native lobster with peas, asparagus, morel mushrooms, goat cheese-stuffed black ravioli, and corn and vanilla cream ($34). This lobster practically melted in my mouth. The vanilla cream paired well with the buttery lobster flavor, and since goat cheese is one of my favorite foods I loved the ravioli too. Plus, all the green on the plate made me feel that I was continuing to eat healthy — healthy enough to go crazy-wild on the chocolate desserts at Max Brenner in a couple hours, ha. Butter poached native lobster with peas, asparagus, morel mushrooms, goat cheese-stuffed black ravioli, and corn and vanilla cream. For dessert, Boyfriend devoured a bowl of Belgian chocolate ice cream for dessert. No cutting corners when it came to the “cream,” either: thick, heavy, gourmet ice cream. I was jealous watching him eat it, but he doesn’t share dessert. It was okay. I would have gone to town on the dessert menu myself if I weren’t following my dinner at 606 Congress with a visit to Max Brenner’s Temple of Chocolate Worship. 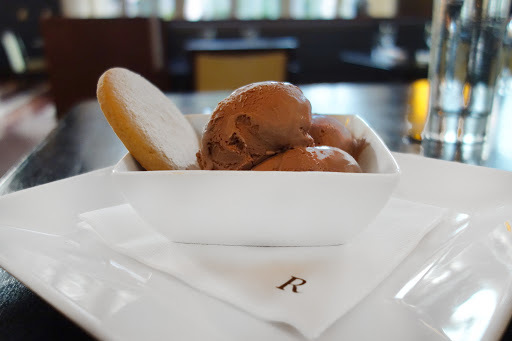 Belgian chocolate ice cream with a cookie. I was happily surprised by my experience at 606 Congress. Usually when I visit a restaurant I’ve researched reviews beforehand, and those reviews are usually a huge factor in deciding to go there in the first place. Instead I went into 606 Congress cold. The food was delicious, the presentation was gorgeous, and the service was notably attentive and quick. The Seaport district isn’t convenient for me so I may not be back as often as I’d like, but it is certainly a hot area of the city and it’s convenient for many people. I had a great meal at 606 Congress, and if you give it a try then I hope you have as good an experience as I did! UPDATE: 606 Congress has closed. A new restaurant, M.C. Spiedo, will be opening in its place.